One last "clearing of the baffles" project that started on the Easter long weekend. 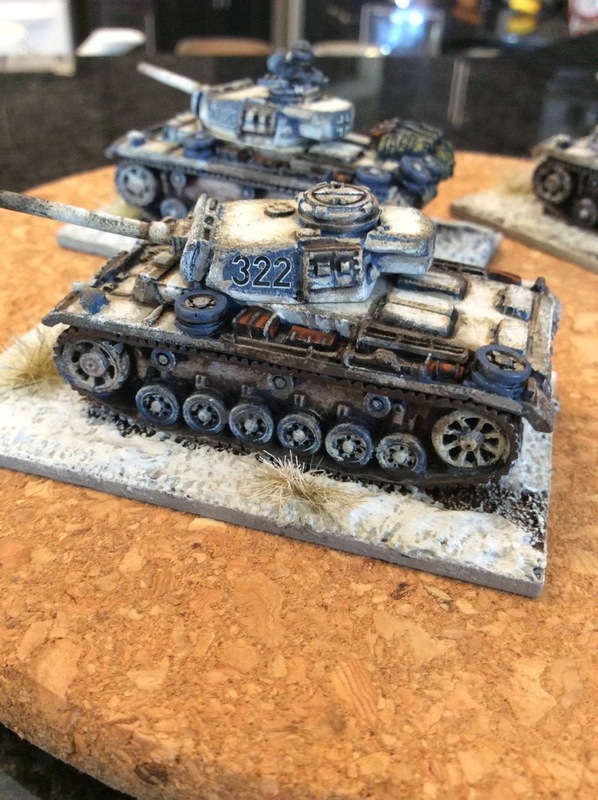 Here is a group of Panzer III-Ls in winter colours. The models are from Peter Pig. 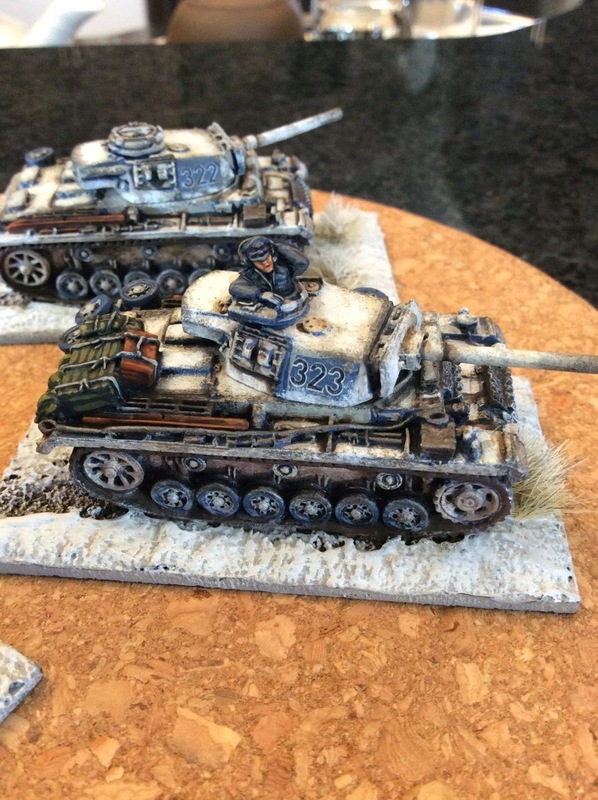 Last fall I started, together with Curt C, a little 15mm winter WW2 project on the Eastern Front. 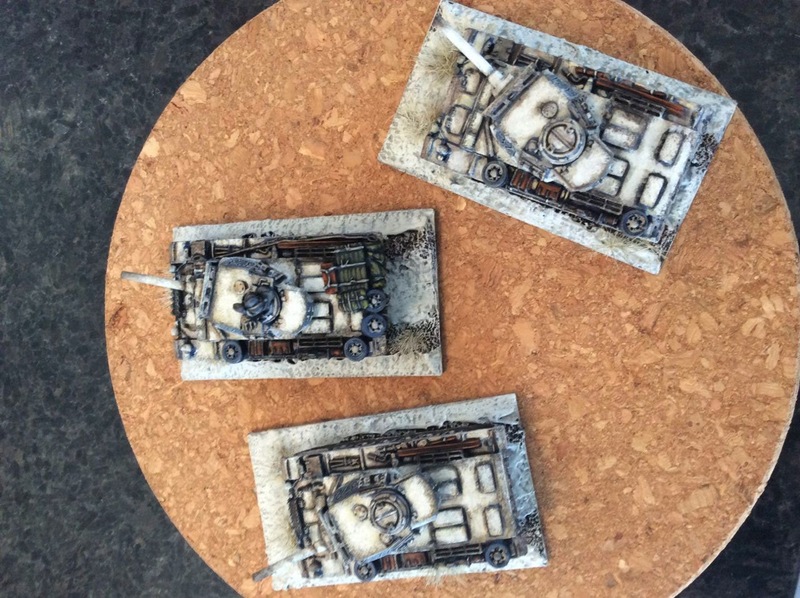 These tanks were meant to be part of that effort, but they have sat there primed yet unpainted for almost six months. I wanted to get them finished off during a little break from my 40k Legion project. And since there were flurries (AGAIN) this weekend, I thought it was appropriate timing. 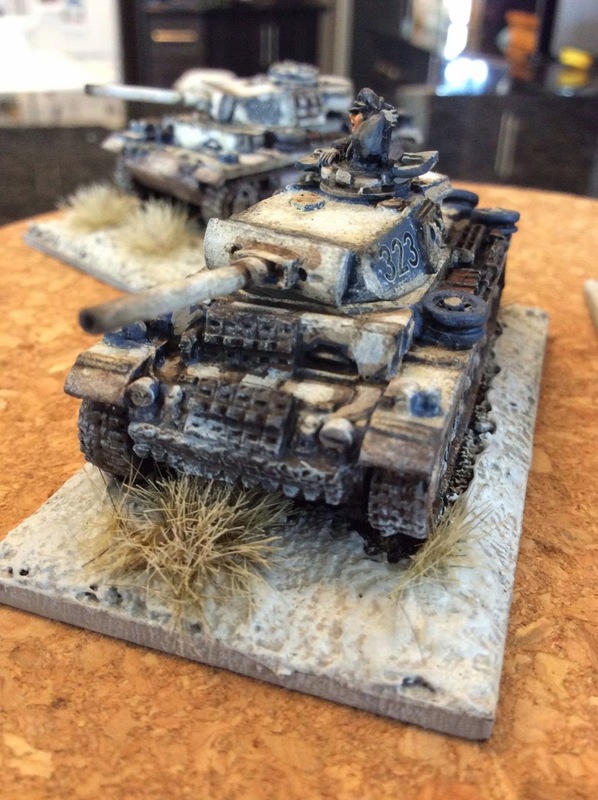 The blue collar late model Panzer III is a favourite tank of mine. 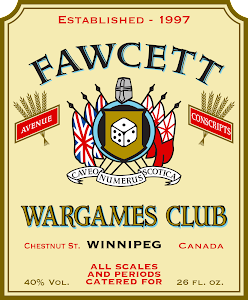 The vehicle has thick plates of extra armour bolted to the front of the turret and the glacis. The gun has been increased in size as much as it can be for the turret (to 50mm) with a longer barrel to add as much velocity as possible to the shots. This tank design has been tweaked to give everything it possibly can in the face of an increasingly superior Soviet adversary! I think this version of the Panzer III saw service late in 1942 and into 1943 - all the way to the fighting at Kursk. The winter of 1942-43 saw some very heavy fighting in the face of the Soviets' shattering counteroffensive around Stalingrad and through the Caucasus region. These models are from Peter Pig, and once again I am blown away by the quality. They were easy to put together, a lot of fun to paint, and they are just gorgeous. I would love to paint a whole company of these models! Peter Pig is tops when it comes to 15mm WW2. 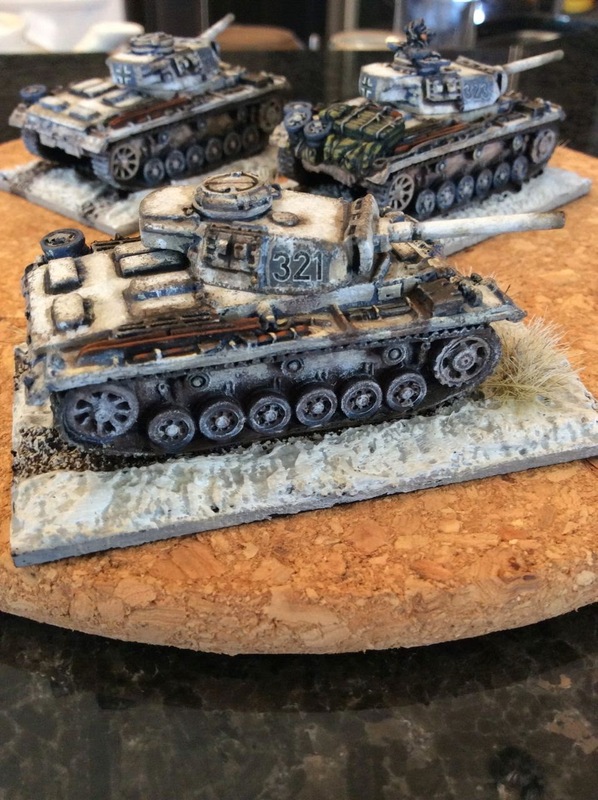 Like my other winter tanks, I put a base coat on ("The Fang" from GW in this case - geez I hate the lame names of their paints) followed by a base off-white to represent the white wash, followed by some heavy duty weathering to represent the abuse dished out by the elements in a Russian winter. I stippled various shades of white on the armour, sponged some dark grey chipping along the edges, and then used some "Agrax Earthshade" and "Nuln Oil" washes from GW to pin-wash some specific spots. The tanks look worn as heck, just the way I like them. These look awesome. 41-43 Eastern Front is the part of the war I've always found most interesting and these are inspiring. phenomenal man, really well done! Inspiring work! Your tanks really look like having been through some vicious fighting. 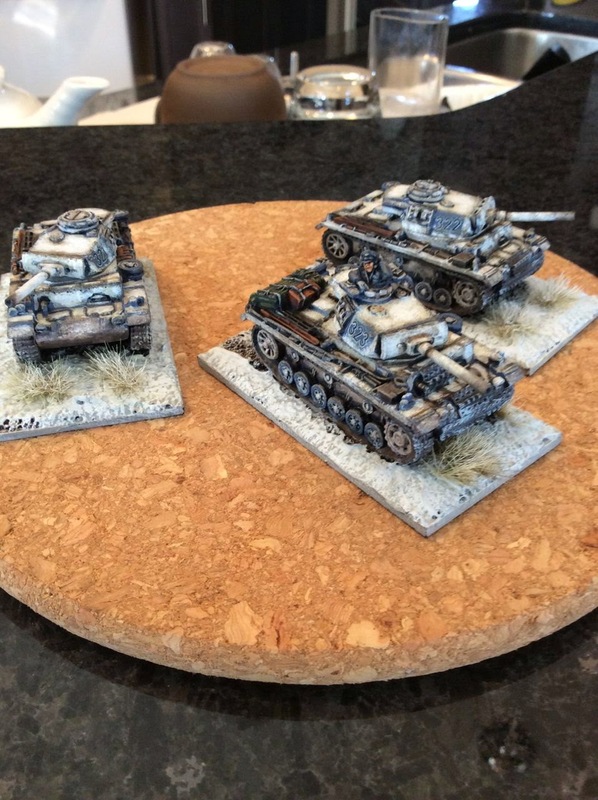 The execution of the painting on these tanks is remarkable- lovely work! Thanks very much guys. My hatred of winter must have inspired me on these ones. 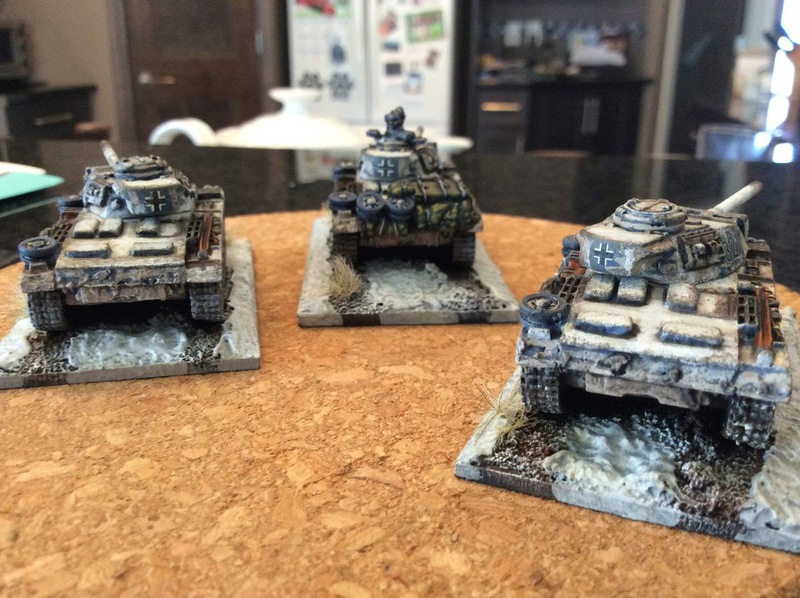 15mm YKW - More T-55s and Terrain Project!